The Ebonheart Pact is a fragile alliance of conflicts based on need. The key for Ebonheart Pact’s success will be overcoming the division and setting old grudges aside. Nords and Dark Elves are old enemies, and Argonians once were slaves of the Dark Elves. United in the aftermath of the Akaviri invasion, each race of the Ebonheart Pact is determined to fight against the Empire and fight for the sovereignty of their homelands. The Ebonheart Pact is governed by an organ called The Great Moot. The ruler of the Pact is Jorunn the Skald-King who hails from Eastern Skyrim. 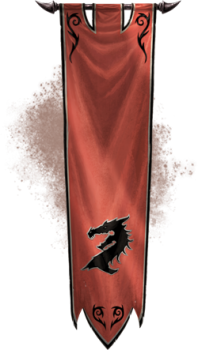 He is the High King of the Great Moot, but all major decisions made by Jorunn have to be ratified by all three races of the alliance. The races of Ebonheart Pact populate the Northern and Eastern Parts of Tamriel. Before Ysgramor led the Nord people south, our ancestors flourished in the frozen continent of Atmora, and to this day our people prefer the bitter climes of northern Tamriel. The Dark Elves abide in Morrowind, a harsh land of ashfall and perpetual earthquakes. The Argonians endure the treacherous and impenetrable depths of Black Marsh. The alliance between our races was born in dark times, when Nord, Dunmer and free Argonians fought as one to repel the invasion of the Akaviri slavemasters. Our greatest strength is the adversity we have overcome. Nords form the frontline unit of the Ebonheart Pact. The inhabitants of Skyrim are weaponmasters, strong warriors, and terrifying foes on the battlefield. Dark Elves or the Dunmer are skilled in magic. The residents of Morrowind are also known for their prowess in dual wield melee combat. Argonians are masters of stealth combat and famous for their resistance against diseases and ability to move quickly in water. Having long defended the borders of the Black Marsh from invaders, the Argonians make natural scouts for the Ebonheart Pact.